Following the construction of the new Johnson Street Bridge, there will be a new green space created. It has been proposed that public art goes into the space. For the public art component, I propose that we make a large unique structure that will be iconic throughout the world. A large structure made of metal to invoke a shape, a silhouette of Cthulhu overlooking the Inner Harbour of Victoria BC. I propose a 50-foot tall metal and fibreglass structure invocative of the creature “Cthulhu” from the horror works of HP Lovecraft. This will not be a solid structure, it will be largely hollow, making use of negative space. It will greet visitors as they come to Victoria. It will take a share of the skyline in a way no one city has ever done. I have built a man-sized Cthulhu sculpture. Mounted on our front lawn, it literally stops traffic. In popular culture, Cthulhu appears or influences works from South Park to Pacific Rim. There are several reasons why this concept should turn into public art to welcome visitors to the Inner Harbour. All of these reasons connect to who we are as a community. Victoria Is Literate - Victoria and the region sports some of the highest literacy rates in Canada. We love books whether they come from Bolens, Munros, or the number of used bookstores we sport. We love to read; and often our attention turns to works of horror and science fiction. This work of art would be a tribute to those legions of readers. Victoria Is Gothic - Lovecraft was born at the turn of the 20th century. He was influenced by Poe and other gothic writers. Victoria is home to a number of heritage properties that would be better suited to backdrop gothic horror. It's easy to imagine that Lovecraft could have been transplanted from Rhode Island to Vancouver Island with the impact of the surroundings still intact. Victoria Is Unique - Victoria is known worldwide. People come here for honeymoons, vacations and special conferences. We sport small shops, unique restaurants, a mix of cultures and lots of great green space. Victoria Is Weird - Look at the Gexus (the intersection of Johnson and Broad): comic book, gaming, toys, collectibles-- we have a large and healthy population of geeks, alternative culture and art that verges on the avante garde. We should have public art that speaks to that. The work is a fusion of homage to literature and pop culture with respect for the space it will inhabit. The image of Cthulhu will evoke reminders of monster movies from the 1950s and 1960s. The height of the artwork will be similar to that of the movie monster, King Kong. This work will provide a sense of size and mass. It will be formed with metal, but like other large artworks, it will be largely hollow. It’s silhouette will evoke the figure of Cthulhu and its unique shape. At over 50 feet tall, it will be able to reach toward the harbour like a modern day Colossus of Rhodes. The metal will be formed to both maintain the outline, but to also look organic and flowing like the nature around the public art. As it is largely hollow, it will not cast a shadow that could impede the growth of plants in the nearby green space. The use of negative space will allow people to bring their own perceptions to the work to fill it in with their imagination. This will be similar to the artwork found South of the Peace Arch border crossing. Many of the segments of the metal structure are bonded with foam sealed with durable fiberglass to make the space safe to use. The tail and lower regions will serve as a play area and climbing structure for children who will be able to climb into the space for recreation. Public art that the public cannot tangibly enjoy serves no one. 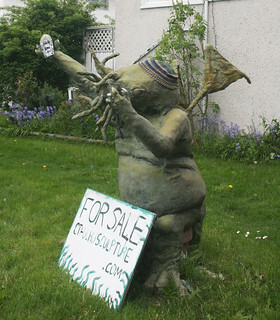 There are a number of ways that can come together to make the Cthulhu Sculpture a reality. Share this post. Do you live in Victoria and do you want to see this happen? Do you not live in Victoria, but would you come here to get your photo taken in front of Cthulhu? 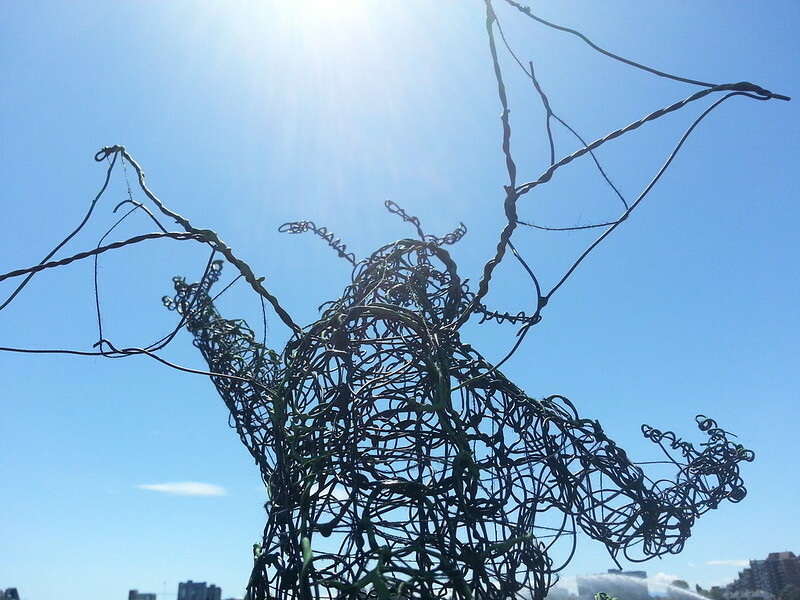 Join the Public Art Committee - http://www.victoria.ca/EN/meta/news/news-archives/2014-archive/share-your-bright-ideas-committee-recruitment.html. Use your influence to get them to support this unique piece of artwork for Victoria, done by a Victoria artist. At some point, there will be a call for submissions for the public art project. When that happens, if there is support for this project, I will ask for that support to manifest as letter of support and a press to influence the decision. Stay tuned for a Part Two to this call to action. The public art project is attached to the Johnson Street Bridge. It is common that a small share of a large project will be earmarked for the public art. The parent project may come under budget stress that could eat up the public art element. If that happens, people with a fondness for Cthulhu could step up, each one making a dent in the budget, and crowdfund the project. If that happens, this project for the space becomes prudent. The crowdsourced support will indicate public will. The funds from the campaign will make it a zero dollar prospect. What do you say? Do you think Cthulhu should rise over Victoria?